Seduta su fusto a slitta, disponibile con struttura in acciaio cromato e scocca in polipropilene con imbottitura in pelle, ecopelle, tessuto o tessuto cliente applicata alla superficie di seduta. Disponibili braccioli in acciaio e polipropilene, anche rivestiti. Catifa 53 is the spark from which an entire seating system has been created. Unique in style, the models and materials used are evolving constantly – and the focus on users’ well-being and environmental balance is just as constant. A design concept that is stylishly direct in use and aesthetic appeal, it adapts to any environment and situation, depending on the model selected: kitchen or living room, office or restaurant, waiting room or hotel. The Catifa 53 collection provides scope for numerous style and customisation solutions. The shell is available in wood or one- or two-colour polypropylene using the Color-Bi procedure: an Arper patent. Catifa 53 can be upholstered in leather, faux-leather, fabric, hide or cuoietto. A range of options is also available for the base: 4-leg, sled or swivel, with or without armrests, in steel or aluminium, height-adjustable office chair, or bench. Now Catifa 46 and 53 can be further customized with fabric covers that slide on and zip up to enliven and adapt polypropelene shells. Available in a curated selection of Kvadrat fabrics, the covers incorporate contrasting top-stitch patterns to create focus and interest as well as comfort and warmth. A welcome addition to the Catifa family, these useful garments even further extend the ability of the system to adapt to almost any application or environment. Covers can be laundered, replaced, or alternated. A change of attire can create a whole new attitude. Experiment here. 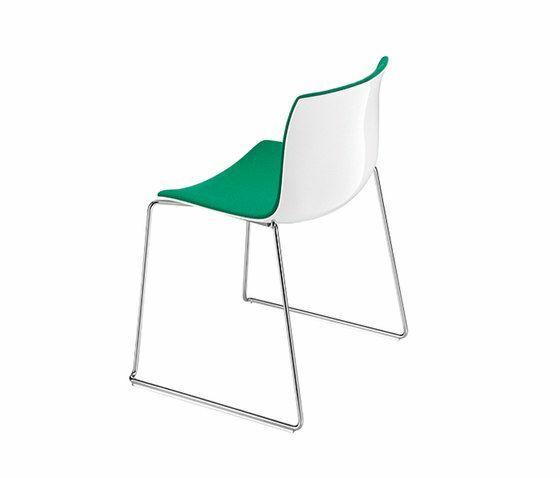 For the one- or two-colour polypropylene models with trestle and 4-leg base in chromed steel, Arper has obtained Environmental Product Declaration (EPD) certification. The models in non-upholstered polypropylene and base in painted steel or aluminium have been awarded Good Environmental Choice Australia (GECA) certification.